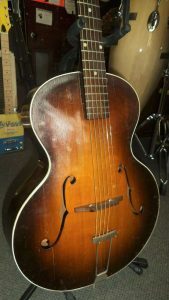 VINTAGE ABBOTT ‘ARISTONE’ ARCHTOP GUITAR. ENGLAND, 1930’s. 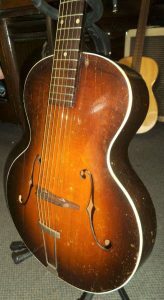 Here is a lovely ‘old school’ archtop guitar, model LW, handmade by Jack Abbott senior, London, England around 1933. All solid wood, shame it’s missing its ‘Aristone’ badge from the headstock. The label states – ‘Hand Made by J.G. ABBOTT & Co Ltd – the Guitar Craftsmen – LONDON W2’. The serial number stamped on the back of the headstock is 372. It’s in great playable condition for its age, with plenty of ‘mojo’. I have reset the neck to the body, no easy task. So it now has a great action with a high bridge, so there is plenty of room for adjustment…..but since I sold it to the previous owner, (about 7 years ago), it has developed a slight twist in the neck. Luckily it is on the low E side, so doesn’t affect its playability at all. There are 3 cracks, repaired from the inside when I did the neck reset, one above and one below the left F hole, and one below the right F hole. No separations, rare for a guitar this age. It has its original tailpiece and Grover tuners, missing its scratchplate. 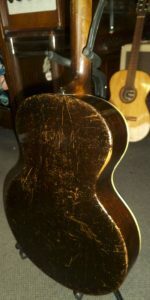 Numerous scratches and dings, it has quite a small body, unusual for an archtop from this period.